A few years back, home brewing was all the rage but there weren’t very many success stories, rather tales of bitter, undrinkable, backyard brews that left a bad taste in your mouth and potentially, a rotten headache next morning! Then, all across Australia, boutique breweries started popping up, releasing ‘craft beers’ for the savvy beer connoisseur, aka hipsters. True, there are a few of these beers worth drinking but many of them are not widely available and certainly not available locally. Fortunately, a hero is among us. Daryl Levy, proprietor of Silky Oak Tea Gardens Crafty Brewery in Kia Ora is brewing his own craft beers and apple cider on-premise. And yes, they taste great! And yes, they are preservative free, so if you drink a few too many, you won’t wake up with a dreaded headache. The weekend of September 8 and 9, Daryl and Helen will host their inaugural Kia Ora Beer Festival. Saturday night, September 8, bands from the Gympie Blues Club will perform from 7pm. Sunday, enjoy live music from Billy Guy who will play from 12 noon to 4pm. Of course, Daryl’s famous beers and apple cider will be readily available and certainly enjoyed. For more information, call 5486 5535. Bookings appreciated. Daryl Levy and his partner Helen Dean have been running Silky Oak Tea Gardens for more than 20 years. “I have always had a strong association with beer – either from one side of the bar or other,” chuckled Daryl. 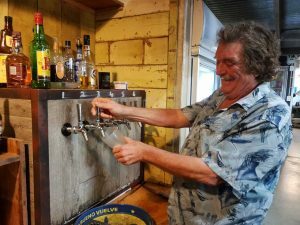 “It makes sense to offer our very own beer because we wanted to provide our clientele with something different from conventional beer and cider. “Due to the size and nature of the place, being able to offer these boutique beers was a logical extension on what we already have,” he said. Five beers and one apple cider are currently available on tap. I was fortunate enough to sample a few – a great afternoon at work! Here are my thoughts (from an uneducated but experienced beer drinker). This is a refreshing ale, light in colour, thirst quenching. Delicious. Daryl says it’s the perfect beer to enjoy after a hard day’s work. Brewed using imported ‘Rakau’ and ‘Motueka’ New Zealand hops, this is probably my favourite. It offers a sharp citrus taste, a hint of passionfruit and grapefruit. Very enjoyable. This is a dark beer with a rich, malty texture. Dark beer can be an acquired taste but this one is particularly good, so if you’re not usually a dark beer drinker, this one is definitely worth a try. A sharp tasting Pilsner. Yummy! Tap number five – Hop Premium Lager (full strength) I am really enjoying myself at this point! This one is a little bit fancy. Daryl said, ‘It’s a keeper, it’s a classy beer and very popular. “The customers drink me dry on the weekends, they all get stuck at tap number five!” he laughed. So there you have it folks – next time you are driving past, don’t. Stop in and try one of Daryl’s brews. Helen whips up a great lunch and dinner too. Silky Oak Tea Gardens and Crafty Brewery are open for lunch seven days a week and dinner every Wednesday through to Saturday. Don’t forget, every Sunday between 12 noon and 4pm, you can enjoy live music and lunch. Sunday September 2 is Father’s Day and is no exception. Book a table and take dad out for lunch, great live music and a few beers. The next legendary Friday Full Moon ‘Pig on the spit’ will be Friday September 28 from 7pm.